Crownland of Austria. The earliest documents referring to its Jews date from thebeginning of the fourteenth century. The statement, found in the "Privilegium Ecclesiæ S. Stephani" in Rendena (Hormayr, "Gesch. 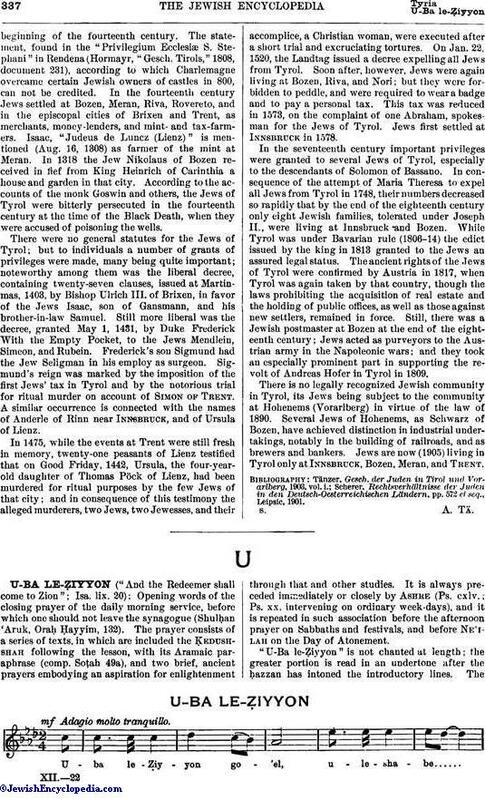 Tirols," 1808, document 231), according to which Charlemagne overcame certain Jewish owners of castles in 800, can not be credited. In the fourteenth century Jews settled at Bozen, Meran, Riva, Rovereto, and in the episcopal cities of Brixen and Trent, as merchants, money-lenders, and mint- and tax-farmers. Isaac, "Judeus de Luncz (Lienz)" is mentioned (Aug. 16, 1308) as farmer of the mint at Meran. In 1318 the Jew Nikolaus of Bozen received in fief from King Heinrich of Carinthia a house and garden in that city. According to the accounts of the monk Goswin and others, the Jews of Tyrol were bitterly persecuted in the fourteenth century at the time of the Black Death, when they were accused of poisoning the wells. There were no general statutes for the Jews of Tyrol; but to individuals a number of grants of privileges were made, many being quite important; noteworthy among them was the liberal decree, containing twenty-seven clauses, issued at Martinmas, 1403, by Bishop Ulrich III. of Brixen, in favor of the Jews Isaac, son of Gansmann, and his brother-in-law Samuel. Still more liberal was the decree, granted May 1, 1431, by Duke Frederick With the Empty Pocket, to the Jews Mendlein, Simeon, and Rubein. Frederick's son Sigmund had the Jew Seligman in his employ as surgeon. Sigmund's reign was marked by the imposition of the first Jews' tax in Tyrol and by the notorious trial for ritual murder on account of Simon of Trent. A similar occurrence is connected with the names of Anderle of Rinn near Innsbruck, and of Ursula of Lienz. In 1475, while the events at Trent were still fresh in memory, twenty-one peasants of Lienz testified that on Good Friday, 1442, Ursula, the four-year-old daughter of Thomas Pöck of Lienz, had been murdered for ritual purposes by the few Jews of that city; and in consequence of this testimony the alleged murderers, two Jews, two Jewesses, and their accomplice, a Christian woman, were executed after a short trial and excruciating tortures. On Jan. 22, 1520, the Landtag issued a decree expelling all Jews from Tyrol. Soon after, however, Jews were again living at Bozen, Riva, and Nori; but they were forbidden to peddle, and were required to wear a badge and to pay a personal tax. This tax was reduced in 1573, on the complaint of one Abraham, spokesman for the Jews of Tyrol. Jews first settled at Innsbruck in 1578. In the seventeenth century important privileges were granted to several Jews of Tyrol, especially to the descendants of Solomon of Bassano. In consequence of the attempt of Maria Theresa to expel all Jews from Tyrol in 1748, their numbers decreased so rapidly that by the end of the eighteenth century only eight Jewish families, tolerated under Joseph II., were living at Innsbruck and Bozen. While Tyrol was under Bavarian rule (1806-14) the edict issued by the king in 1813 granted to the Jews an assured legal status. The ancient rights of the Jews of Tyrol were confirmed by Austria in 1817, when Tyrol was again taken by that country, though the laws prohibiting the acquisition of real estate and the holding of public offices, as well as those against new settlers, remained in force. Still, there was a Jewish postmaster at Bozen at the end of the eighteenth century; Jews acted as purveyors to the Austrian army in the Napoleonic wars; and they took an especially prominent part in supporting the revolt of Andreas Hofer in Tyrol in 1809. 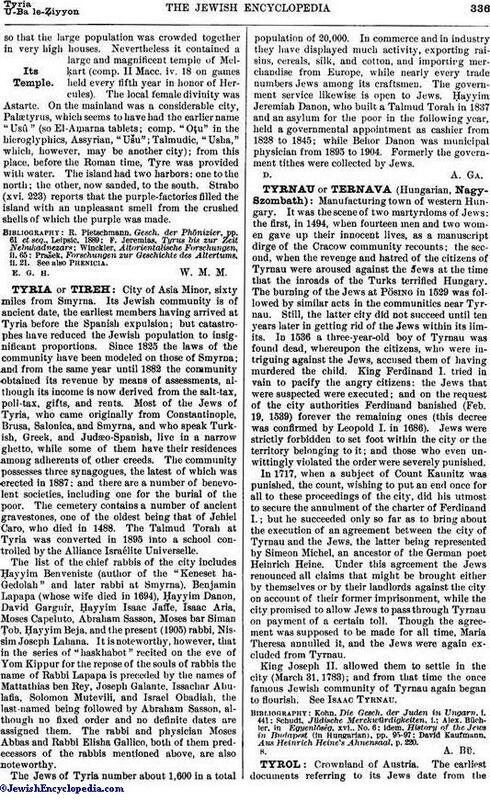 There is no legally recognized Jewish community in Tyrol, its Jews being subject to the community at Hohenems (Vorarlberg) in virtue of the law of 1890. Several Jews of Hohenems, as Schwarz of Bozen, have achieved distinction in industrial undertakings, notably in the building of railroads, and as brewers and bankers. Jews are now (1905) living in Tyrol only at Innsbruck, Bozen, Meran, and Trent. Scherer, Rechtsverhältnisse der juden in den Deutsch-Oesterreichischen Ländern, pp. 572 et seq., Leipsic, 1901.